In my attempt to channel my inner Barbara Walters, I recently gave some credit counselling advice to my friend and colleague, Liset, regarding her experience making a large purchase and the sales pressures that came with it. I jokingly warned her I’d try not to make her cry! Reciprocity, wanting to return the favour when someone does something nice for us. Social proof, people often do what others do. Likability, people often buy from salespeople they like, they trust and they are similar to. Scarcity, people want products that are hard to find. Devotion and consistency, once a client acts a certain way they are more likely to continue to act that way or by starting with a small commitment that will lead to a larger one. Command, we tend to trust authority figures and those with titles or credentials such as professor or Dr. While the use of these techniques to influence consumer behaviour is prevalent, there is no harm in a salesperson being extra smiley to make a sale. Being aware of them, however, can help us avoid any unwise decisions we may otherwise make. The danger is when sales tactics go too far and enter the realm of manipulation and extreme pressure. 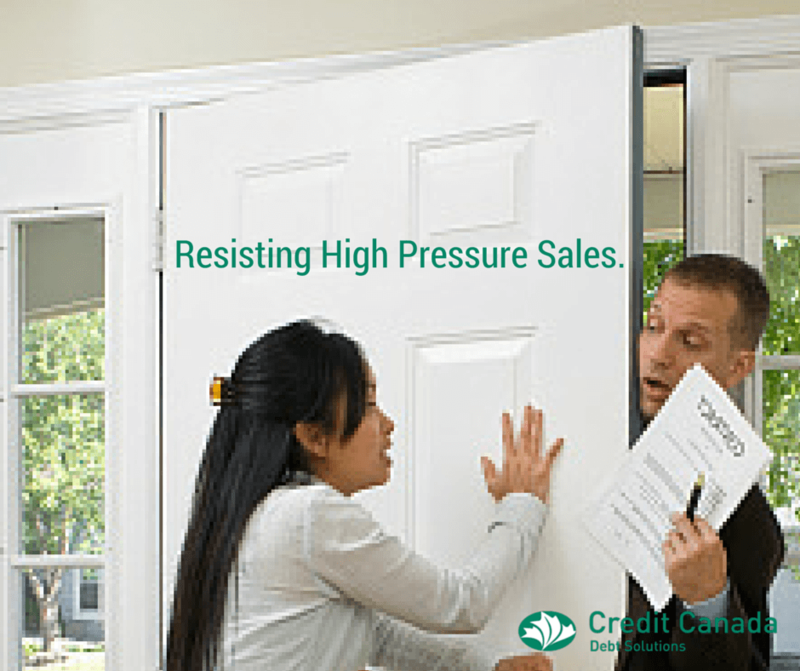 While providing credit counselling services for Canadians we see the ramifications of falling prey to these high pressure tactics all the time. Back to poor Liset and her sales pressure woes. Right in the dead of winter, her furnace needed replacing. Under the pressure of dropping temperatures and the worry that her pipes might freeze, Liset hastily agreed to rent a furnace from a large energy company. This would cost $80/month plus taxes over the life of the furnace. After going over the calculations, Liset realized the immense cost of renting over 15 years. She made some calls and found a much cheaper option through a friend to purchase a furnace at a fraction of the price. When Liset contacted the first company to cancel the installation, the agent’s response was “I am very disappointed” and continued to advise her that she will be billed for the portable heaters that were left for temporary use (even though Liset’s insurance with this same company covers this service). There were other unsavory attempts by the salesperson to change her mind such as claiming her rebate with the government would no longer be valid if she decided to use another company (also untrue). Thanks for sharing your story and for the good advice, Liset!